Like all the other major MOBAs, Dota 2 is primarily a player-vs.-player game. NPC monsters only exist for each team to earn powerful character buffs and to make the games more complicated—something MOBAs really love to be. Epic Boss Fight turns this on its head by pitting a five-man team against an array of increasingly hard-to-kill and even more gigantic bad guys. You know, bosses. As this video of an Epic Boss Fight match by the YouTuber Baumi shows, the bosses start out pretty small. More like the normal NPC critters you might clash with in a regular game of Dota 2. Jeez! This brings me back to the first time I ran into a dragon in Baldur’s Gate II. Remember the good old days when all the major bosses were so huge they took up the entire screen? 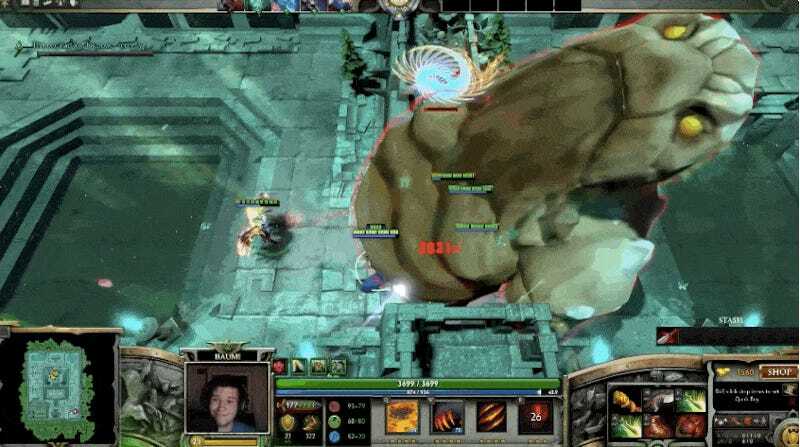 Judging by the feedback on the Epic Boss Fight Steam page, Dota 2 players have been enjoying the custom mode since it first came out with the Reborn beta. The critical responses claim the mode is punishingly difficult in a not-very-well-designed way—saying that it simply ups NPCs’ hit points, reach, and damage to make them increasingly difficult. Many of these detractors insist that FrenchDeath, the mod’s creator, needs to nerf a lot of the monsters. Although if Epic Boss Fight is anything like a regular MOBA, people demanding nerfs is usually a sign that they’re obsessed with the game and enjoying it more than they’d like to admit. To his credit, FrenchDeath admits on the Epic Boss Fight page that the custom game does need additional balancing, which he plans to implement in the future along with more bosses to fight. In the meantime, you can check the game out here, or even support its future development by contributing to its Patreon.